If your oral screening reveals some suspicious areas in the soft tissues of your mouth, we may need to perform a laser biopsy to properly diagnose the sample and determine if there is cause for concern. A biopsy refers to the removal and examination of certain tissues, fluids, or cells from your mouth. We will use our state-of-the-art equipment to perform the biopsy so it can be done as quickly and precisely as possible. Once we have the tissue sample we will send it to a trusted oral pathology lab for microscopic diagnosis. Their findings will help us determine the next step to take. There are several ways to perform a biopsy in the mouth, including incisional biopsies, excitional biopsies, and punch biopsies. However, because the mouth is naturally a moist and confined area, it can be challenging to get a viable tissue sample for testing. 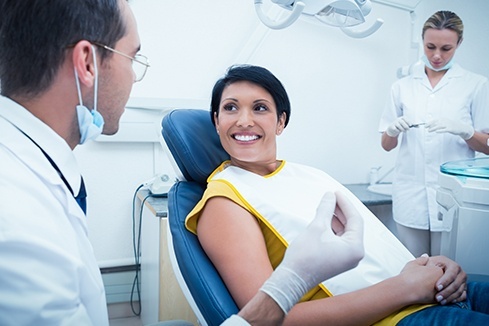 At Maplewood Laser Dental Clinic we use laser equipment to perform these biopsies to ensure we can get the samples we need with minimal impact on your mouth. A laser biopsy also means that smaller lesions can often be removed with only a compounded topical anesthetic. And when it’s all over, sutures are very rarely required because the lasers cause minimal trauma. There’s no reason to take chances and put off getting the diagnosis and care that you need. At Maplewood Laser Dental Clinic we are committed to providing comprehensive care. We go beyond just your teeth to focus on your complete health. A laser biopsy can give us the insight into your health that we need to prescribe the right treatments for your situation. Contact us today to set up your appointment and get checked out today.